﻿ Fly Fishing anglers in Slovenia,come and join us! My name is Jan,one of Maxcatch fly fishing anglers and I come from Slovenia. 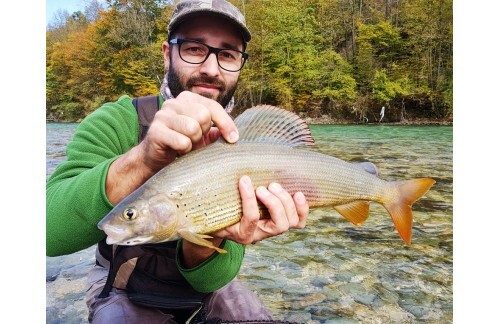 As you may already know, my country known is for gin, crystal clear rivers like Soča, and many other fly fishing anglers also worth attention. If you want to be a good fly fishing anglers you have places like this right on your doorstep and you love nature, there is no reason not to get lost in it and get involved with some kind of outdoor activity. To me, fly fishing iis the one. I dream to be a good fly fishing anglers so I started as a youngster with float and spin fishing, but I always wanted to fly cast. Eventually, that's what I started doing and I will never go back, even though my techniques today mostly don't involve fly line anymore. From the moment I started fly fishing, grayling was my fish. You can't beat the beauty, elegance, speed and selectiveness of this fish. It requires refined techniques and flies and it always leaves me wondering why I keep on pushing to be one of the fly fishing anglers in Slovenia. Maxcatch invited me to be their fly fishing anglers and produces top-quality gear that helps me deal with different situations on water, and I can most definitely rely on their reels when it comes to playing with bigger fish. To have confidence in your tools helps you enjoy your days on the water, and I hope they will continue to do just that - make fly fishers like me happy.